The primacy of the body as object—its fluctuations, trainability, aberrations, procreation, and death—is in a nutshell the Matthew Barney glass bead game. Self described as a sculptor, his five-filmCremaster Cycle (with its attendant sculptures, photographs, and drawings) casts him as many characters: killer Gary Gilmore, Houdini, Masonic apprentice, and goat-man. Their purposes and actions are in large part informed by the cremaster muscle, which, responding to outside stimuli, causes the descent or ascent of the testes, potentially determining gender. Barney’s cool semi-autobiographical exposition of the body’s extremes, potentials, and ultimate transformation through symbolic, wordless narratives is process as metaphor. Its revelation of his and our own cyclical natures is a radical rite of passage into an understanding of culture as biology and visa versa. Located outside of Munich, the Goetz Collection is an internationally renowned private art museum designed by architects Jacques Herzog and Pierre de Meuron, open by appointment only. 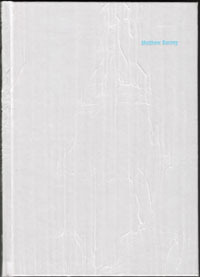 The Collection has given Barney full reign in designing both his solo show there and its catalog, which is itself an organic objet d’art: covered in cocoon-like fabric, it perhaps alludes to Cremaster 3’s Masonic apprentice’s apron, placing the reader at the start of a journey to match Barney’s own transformations. Beyond the layout of images, the book is a field guide to his work, with synopses, incisive essays, interviews, and glossary. No floor map is included, but careful descriptions and full-page spreads take us from the third story to the basement in a chronological descent through the work. From the OTTOshaft1 videos on top, to theCremaster Cycle, to Drawing Restraint 9, there are many detours. Urbashek states that Barney “has personally developed the exhibition concept. . . to liberate the individual as the sole bearer of emotions and to extend this function to architecture as well.” What emotions might these be that are best born by oneself other than those of perverse dreams, gender musings, and love? Perhaps, as he quotes critic Nancy Spector, those associated with “competition, exhibitionism and idolization. . . masculine identity.” Indeed, unifying our masculine descent through the museum and book are the photographs of the wrestling Drawing Restraint 7 satyrs. This brings us to the core of the exhibition and the book, where all five Cremaster films play simultaneously. On high, angled flat screens that jut from a central pole in pentagram formation, the feature-length films play in a kind of punishment for the spectator with no seat in sight. In a sense they represent a perverse sports bar in Barney’s Olympus; the non-player’s hubris must here atone for glimpsing Barney’s locomotions of ambiguities and transgressions, and without beer! The final room of the exhibition, BASE 103, showcases the end of our “male trajectory” and the blossoming of its cold hard love. Drawing Restraint 9 was made after the Cremaster Cycle and is the semi-autobiographical story of Barney and experimental pop singer Björk falling in love during a Japanese Tea Ceremony on a whaling ship. In this final act of contradictions and conflict, the primacy of the body is stripped away into a metaphor of pure being. Barney and Björk sculpt one another into whales with bloody flensing knives, all the better to experience the eternal fluctuations between the genders! As they swim off, I can’t help but think of a Deleuzian Ahab mating with Moby, becoming imperceptible and differentiating and intuiting Nature, both inner and outer. 1OTTOshaft is a pre-Cremaster video series based on legendary Oakland Raider’s quarterback Jim Otto, who trained and played so hard that his knees were replaced with Teflon. In the video, two satyrs wrestle: one is Otto, the other Houdini. They represent the inward and outward conditioning and intent of the mind, spirit, and body. At the end of their contest they flay one another in an act of hubris. 2Becoming Imperceptible is the challenge of no longer acting as a separate and selecting point within the world, but of becoming different with, and through what is perceived. One way to think becoming—other than the perceived image of ‘man’ is through becoming-animal.” from Gilles Deleuzeby Claire Colebrook (Routledge, 2001).